Launch the new communications satellite into space from the launch pad! Drive to the launch pad and help the technician prepare the rocket for blast off into orbit. 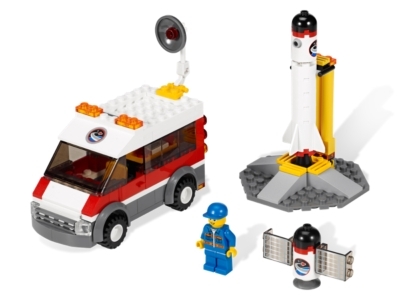 The Satellite Launch Pad (3366) Lego set is no longer directly available from the sites below. However, 3rd party partners of these sites might still have the set available. Alternate description Send this deep space dish over the moon and into orbit! Prepare the rocket for launch to send the new communications satellite soaring into space, includes truck and technician minifigure!